When I was pregnant with Pierce, I received so many cute baby outfits. How can you not love baby clothes? The tiny little socks. Is there anything warmer and fuzzier than a pair of baby socks? Or a cute little blanket sleeper? I think the majority of the clothes we received were from Carter's. It's such a great brand because not only is their clothing line adorable, but it's also affordable. My boys have worn many a pair of Carter's pjs and I love how warm they are in the winter, and also that they don't pill up after numerous washings like some other brands. It comes as no surprise to me that Carter's, the most trusted brand in young children's clothing, is going to be featured in the film What to Expect When You're Expecting when it comes out in theatres on May 18th. (Aren't you dying to see this film? I can't resist a good preggo/baby story). 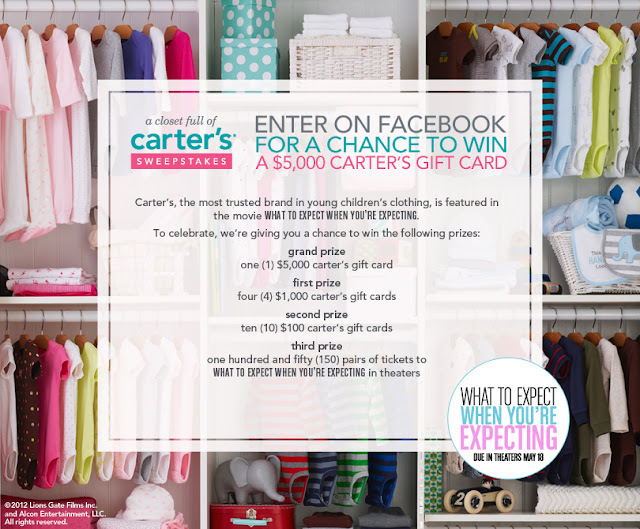 To celebrate the launch of the movie, Carter's is hosting "A Closet Full of Carter's Sweepstakes" on Facebook and giving away over $12,000 in prizes. You can increase your chances to win the $5000 Carter's gift card grand prize or one of the many other awesome giveaways by entering daily on Facebook or on your mobile device from April 16 - May 18th. So go check it out! That's a lot of chances to win, and who wouldn't love to have a closet full of Carter's for their children? Blog Disclaimer: Carter’s partnered with bloggers such as me to promote their upcoming feature in the movie “What to Expect When You’re Expecting.” As part of the program, I received a gift card. Carter’s believes that consumers and bloggers are free to form their own opinions and share them in their own words, and therefore did not tell me what to purchase or what to say about the products I used. Carter’s policies align with WOMMA Ethics Code, FTC guidelines and social media engagement recommendations. Thanks for the Heads Up!! Going to go check it out now. JDaniel lived in Carters when he was a baby! a closet full of new clothes..wow...wouldn't that be fun?! Aren't their clothes the cutest?!!! I absolutely love them! Sounds like a movie I will love...I haven't seen previews for it yet. How did I not know this movie was coming out. Love Carters clothes!